Scores 29 Highway MPG and 21 City MPG! This Jeep Renegade delivers a Regular Unleaded I-4 2.4 L/144 engine powering this Automatic transmission. WHEELS: 17" X 7.0" ALUMINUM (STD), TRANSMISSION: 9-SPEED 948TE AUTOMATIC -inc: Vinyl Shift Knob (STD), TIRES: P215/60R17 BSW AS TOURING (STD). 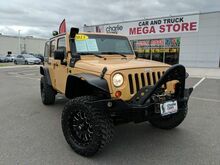 QUICK ORDER PACKAGE 27J -inc: Engine: 2.4L I4 MultiAir, Transmission: 9-Speed 948TE Automatic , MANUFACTURER'S STATEMENT OF ORIGIN, GRANITE CRYSTAL METALLIC CLEARCOAT, FULL SIZE TEMPORARY USE SPARE TIRE -inc: a steel spare wheel, ENGINE: 2.4L I4 MULTIAIR -inc: Engine Oil Cooler (STD), BLACK, CLOTH LOW-BACK BUCKET SEATS, 3.734 AXLE RATIO (STD), Wheels: 17" x 7.0" Aluminum, Variable Intermittent Wipers, Valet Function. 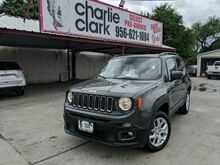 For a must-own Jeep Renegade come see us at Charlie Clark Nissan Brownsville, 2547 North Expressway 77/83, Brownsville, TX 78520. Just minutes away! 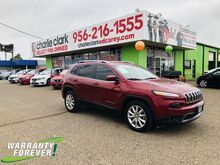 Lavishly luxurious, this 2017 Jeep Cherokee will envelope you in well- engineered charm and security. With a Regular Unleaded I-4 2.4 L/144 engine powering this Automatic transmission, this ride is an intoxicating mix of precision and charm. It is well equipped with the following options: WHEELS: 18" X 7" POLISHED ALUMINUM, TRANSMISSION: 9-SPEED 948TE AUTOMATIC (STD), QUICK ORDER PACKAGE 24G -inc: Engine: 2.4L I4 MultiAir, Transmission: 9-Speed 948TE Automatic, MANUFACTURER'S STATEMENT OF ORIGIN, GVWR: 5,050 LBS (STD), ENGINE: 2.4L I4 MULTIAIR FLEXFUEL -inc: Tigershark, Flex Fuel Vehicle, 50 State Emissions, ENGINE: 2.4L I4 MULTIAIR -inc: Tigershark (STD), DEEP CHERRY RED CRYSTAL PEARLCOAT, COMPACT SPARE TIRE, and BLACK, LEATHER TRIMMED BUCKET SEATS . 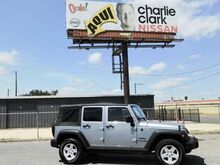 Visit Charlie Clark Nissan at 3500 W Expressway 83, Harlingen, TX 78550 today. Delivers 29 Highway MPG and 21 City MPG! This Jeep Cherokee delivers a Regular Unleaded V-6 3.2 L/198 engine powering this Automatic transmission. TRANSMISSION: 9-SPEED 948TE AUTOMATIC (STD), QUICK ORDER PACKAGE 26J -inc: Engine: 3.2L V6 24V VVT w/ESS, Transmission: 9-Speed 948TE Automatic, POWER 8-WAY DRIVER SEAT -inc: Power 4-Way Driver Lumbar Adjust. ENGINE: 3.2L V6 24V VVT W/ESS -inc: Pentastar, Stop-Start Multiple VSM System, 3.25 Axle Ratio, 700 Amp Maintenance Free Battery, Anti-Lock 4-Wheel-Disc Brakes, Dual Bright Exhaust Tips, GVWR: 5,500 lbs, COMFORT & SOUND GROUP -inc: 9 Amplified Speakers w/Subwoofer, BRIGHT WHITE CLEARCOAT, BLACK, PREMIUM CLOTH BUCKET SEATS, 9 AMPLIFIED SPEAKERS W/SUBWOOFER, 3.25 AXLE RATIO, Wheels: 17" x 7" Aluminum, Variable Intermittent Wipers, Valet Function, Urethane Gear Shift Knob. 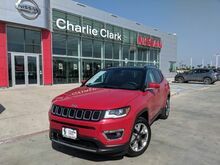 Come in for a quick visit at Charlie Clark Nissan Brownsville, 2547 North Expressway 77/83, Brownsville, TX 78520 to claim your Jeep Cherokee! Boasts 26 Highway MPG and 19 City MPG! Carfax One-Owner Vehicle. This Jeep Grand Cherokee delivers a Regular Unleaded V-6 3.6 L/220 engine powering this Automatic transmission. WHEELS: 17" X 8.0" ALUMINUM (STD), TRANSMISSION: 8-SPEED AUTOMATIC (850RE) (STD), TIRES: P245/70R17 BSW ON/OFF ROAD (STD). QUICK ORDER PACKAGE 2BE -inc: Engine: 3.6L V6 24V VVT UPG I w/ESS, Transmission: 8-Speed Automatic (850RE), Power 4-Way Driver Lumbar Adjust, Bright Side Roof Rails, Power 8-Way Driver/Manual Passenger Seat , MANUFACTURER'S STATEMENT OF ORIGIN, LT FROST BEIGE/BLACK, CLOTH LOW BACK BUCKET SEATS, ENGINE: 3.6L V6 24V VVT UPG I W/ESS (STD), ECO SUSPENSION I (STD), BILLET SILVER METALLIC CLEARCOAT, Wheels: 17" x 8.0" Aluminum, Valet Function, Trip Computer, Transmission: 8-Speed Automatic (850RE). Scores 26 Highway MPG and 19 City MPG! Carfax One-Owner Vehicle. This Jeep Cherokee delivers a Regular Unleaded V-6 3.2 L/198 engine powering this Automatic transmission. WHEELS: 17" X 7.5" ALUMINUM (STD), VENTILATED/HEATED SEAT GROUP -inc: Ventilated Front Seats, Exterior Mirrors w/Memory, Exterior Mirrors w/Heating Element, Exterior Mirrors Courtesy Lamps, Radio/Driver Seat/Exterior Mirrors Memory, Exterior Mirrors w/Supplemental Signals, Power Multi-Function Fold Away Mirrors, TRANSMISSION: 9-SPEED 948TE AUTOMATIC 2 SPEED PTU (STD). QUICK ORDER PACKAGE 27E -inc: Engine: 3.2L V6 24V VVT, Transmission: 9-Speed 948TE Automatic 2 Speed PTU , LEATHER INTERIOR GROUP -inc: Heated Front Seats, Heated Steering Wheel, Power 4-Way Driver Lumbar Adjust, Power 8-Way Driver Seat, ENGINE: 3.2L V6 24V VVT -inc: Pentastar, Stop-Start Multiple VSM System, 3.25 Axle Ratio, 50 State Emissions, Dual Bright Exhaust Tips, 3 Additional Gallons Of Gas, COMFORT/CONVENIENCE GROUP -inc: Premium Air Filter, Power Liftgate, SIRIUSXM Satellite Radio, No Satellite Coverage w/AK/HI, Passive Entry/Keyless Go, Rear View Auto Dim Mirror w/Microphone, Universal Garage Door Opener, Air Conditioning ATC w/Dual Zone Control, Remote Start System, Power 4-Way Driver Lumbar Adjust, Remote Proximity Keyless Entry, Security Alarm, Power 8-Way Driver Seat, Humidity Sensor, BROWN, PREMIUM LEATHER TRIMMED BUCKET SEATS, BRIGHT WHITE CLEARCOAT, BLACK HOOD DECAL, 3.25 AXLE RATIO, Wheels: 17" x 7.5" Aluminum, Vinyl Door Trim Insert. Scores 26 Highway MPG and 19 City MPG! Carfax One-Owner Vehicle. This Jeep Grand Cherokee delivers a Regular Unleaded V-6 3.6 L/220 engine powering this Automatic transmission. WHEELS: 17" X 8.0" ALUMINUM (STD), TRANSMISSION: 8-SPEED AUTOMATIC (850RE) (STD), TIRES: P245/70R17 BSW ON/OFF ROAD (STD). 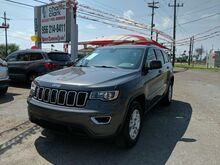 QUICK ORDER PACKAGE 2BE -inc: Engine: 3.6L V6 24V VVT UPG I w/ESS, Transmission: 8-Speed Automatic (850RE), Power 4-Way Driver Lumbar Adjust, Bright Side Roof Rails, Power 8-Way Driver/Manual Passenger Seat , MANUFACTURER'S STATEMENT OF ORIGIN, GRANITE CRYSTAL METALLIC CLEARCOAT, FULL SIZE SPARE TIRE -inc: Steel Spare Wheel, ENGINE: 3.6L V6 24V VVT UPG I W/ESS (STD), ECO SUSPENSION I (STD), BLACK, CLOTH LOW BACK BUCKET SEATS, Wheels: 17" x 8.0" Aluminum, Valet Function, Trip Computer. 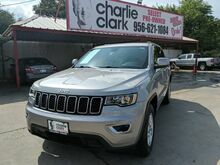 A short visit to Charlie Clark Nissan Brownsville located at 2547 North Expressway 77/83, Brownsville, TX 78520 can get you a trustworthy Grand Cherokee today! Boasts 26 Highway MPG and 19 City MPG! Carfax One-Owner Vehicle. This Jeep Grand Cherokee boasts a Regular Unleaded V-6 3.6 L/220 engine powering this Automatic transmission. WHEELS: 18" X 8.0" TECH GRAY ALUMINUM (STD), TRANSMISSION: 8-SPEED AUTOMATIC (850RE) (STD), TIRES: P265/60R18 BSW AS LRR (STD). QUICK ORDER PACKAGE 2BH -inc: Engine: 3.6L V6 24V VVT UPG I w/ESS, Transmission: 8-Speed Automatic (850RE) , RADIO: UCONNECT 3C NAV W/8.4" DISPLAY -inc: SiriusXM Travel Link, 5-Year SiriusXM Travel Link Service, 5-Year SiriusXM Traffic Service, HD Radio, GPS Navigation, Rear View Auto Dim Mirror, Uconnect Access, For Details Visit DriveUconnect.com, 8.4" Touchscreen Display, Roadside Assistance & 9-1-1 Call, Integrated Voice Command w/Bluetooth, SiriusXM Traffic, MANUFACTURER'S STATEMENT OF ORIGIN, LUXURY GROUP II -inc: Ventilated Front Seats, Bi-Xenon HID Headlamps, Auto High Beam Headlamp Control, Rain Sensitive Windshield Wipers, LED Daytime Running Headlamps, 9 Amplified Speakers w/Subwoofer, 506 Watt Amplifier, Power Tilt/Telescope Steering Column, Cargo Compartment Cover, Automatic Headlamp Leveling System, Dual-Pane Panoramic Sunroof, LED Fog Lamps, Radio: Uconnect 3C w/8.4" Display, Nav-Capable! 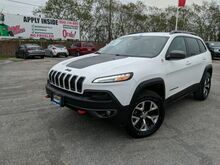 See Dealer for Details, Uconnect Access, For Details Visit DriveUconnect.com, 8.4" Touchscreen Display, Roadside Assistance & 9-1-1 Call, Integrated Voice Command w/Bluetooth, LT FROST BEIGE/BLACK, LEATHER TRIMMED SEATS W/PERFORATED INSERTS, ENGINE: 3.6L V6 24V VVT UPG I W/ESS (STD), ECO SUSPENSION I (STD), DIAMOND BLACK CRYSTAL PEARLCOAT, 9 AMPLIFIED SPEAKERS W/SUBWOOFER, 3.27 REAR AXLE RATIO (STD). 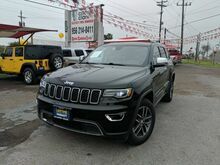 For a must-own Jeep Grand Cherokee come see us at Charlie Clark Nissan Brownsville, 2547 North Expressway 77/83, Brownsville, TX 78520. Just minutes away! Scores 31 Highway MPG and 22 City MPG! This Jeep Compass boasts a Regular Unleaded I-4 2.4 L/144 engine powering this Automatic transmission. WHEELS: 18" X 7.0" POLISHED/GRAY POCKETS ALUMINUM (STD), TU-TONE PAINT GROUP, TRANSMISSION: 6-SPEED AISIN F21-250 GEN 3 AUTO (STD). QUICK ORDER PACKAGE 28G -inc: Engine: 2.4L I4 Zero Evap M-Air w/ESS, Transmission: 6-Speed Aisin F21-250 Gen 3 Auto , TIRES: P225/55R18 BSW AS (STD), SAFE & SECURITY GROUP -inc: Rain Sensitive/Intermittent Wipers, Blind Spot & Cross Path Detection, ParkSense Rear Park Assist System, REDLINE PEARLCOAT, RADIO: UCONNECT 4C NAV W/8.4" DISPLAY, POWER LIFTGATE, NAVIGATION GROUP -inc: Radio: Uconnect 4C Nav w/8.4" Display, MANUFACTURER'S STATEMENT OF ORIGIN, ENGINE: 2.4L I4 ZERO EVAP M-AIR W/ESS (STD), BLACK, LEATHER TRIMMED BUCKET SEATS. A short visit to Charlie Clark Nissan Brownsville located at 2547 North Expressway 77/83, Brownsville, TX 78520 can get you a dependable Compass today! Only 47,417 Miles! Scores 21 Highway MPG and 16 City MPG! This Jeep Wrangler Unlimited boasts a Gas V6 3.6L/220 engine powering this Manual transmission. SIRIUSXM SATELLITE RADIO -inc: 1-year subscription, P255/75R17 ON/OFF-ROAD OWL TIRES, MOPAR BLACK APPEARANCE GROUP -inc: Mopar black fuel filler door, Mopar black tail lamp guards, Mopar black tubular side steps. 23S CUSTOMER PREFERRED ORDER SELECTION PKG -inc: 3.6L V6 engine, 6-speed manual trans, 17" x 7.5" aluminum wheels, Rugged Ridge Snorkel, Smittybilt XRC Winch Mount, auto-dimming rearview mirror w/reading lamp, chrome/leather-wrapped shift knob, deep-tint sunscreen windows, leather-wrapped steering wheel, P255/75R17 on/off-road OWL tires, pwr door locks, pwr windows w/front one-touch down, pwr heated exterior mirrors, remote keyless entry, security alarm , DUNE, CONVENTIONAL REAR DIFFERENTIAL (STD), CONNECTIVITY GROUP -inc: chrome/leather-wrapped shift knob, leather-wrapped steering wheel, tire pressure monitoring display, Uconnect voice command w/Bluetooth, remote USB port, vehicle info center, BLACK INTERIOR, CLOTH SEAT TRIM, BLACK 3-PIECE HARD TOP -inc: freedom panel storage bag, rear window defroster, rear window wiper w/washer, tinted rear windows, 6-SPEED MANUAL TRANSMISSION (STD), 3.73 AXLE RATIO, 3.6L SMPI 24V VVT V6 ENGINE (STD), 17" X 7.5" ALUMINUM WHEELS. 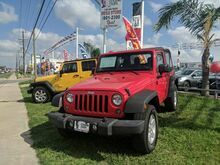 For a must-own Jeep Wrangler Unlimited come see us at Charlie Clark Nissan Brownsville, 2547 North Expressway 77/83, Brownsville, TX 78520. Just minutes away! Scores 20 Highway MPG and 16 City MPG! This Jeep Wrangler Unlimited delivers a Regular Unleaded V-6 3.6 L/220 engine powering this Automatic transmission. Part-Time Four-Wheel Drive, WHEELS: 16" X 7.0" LUXURY STYLED STEEL (STD), TRANSMISSION: 5-SPEED AUTOMATIC (W5A580) -inc: Hill Descent Control, Tip Start. 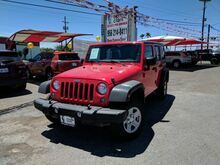 QUICK ORDER PACKAGE 24C -inc: Engine: 3.6L V6 24V VVT, Transmission: 5-Speed Automatic (W5A580) , TIRES: P225/75R16 BSW ON/OFF ROAD (STD), SIRIUS SATELLITE RADIO -inc: 1-Yr SIRIUSXM Radio Service, For More Info Call 888-539-7474, RADIO: 430 -inc: Remote USB Port, JEEP TRAIL RATED KIT, FIRECRACKER RED CLEARCOAT, ENGINE: 3.6L V6 24V VVT (STD), CONNECTIVITY GROUP -inc: Uconnect Voice Command w/Bluetooth, Vehicle Information Center, Remote USB Port, Tire Pressure Monitoring Display, BLACK, CLOTH SEATS W/ADJUSTABLE HEAD RESTRAINTS, BLACK 3-PIECE HARD TOP -inc: Rear Window Defroster, Delete Sunrider Soft Top, Freedom Panel Storage Bag, Rear Window Wiper/Washer. This Jeep Wrangler Unlimited has a powerful Regular Unleaded V-6 3.6 L/220 engine powering this Automatic transmission. 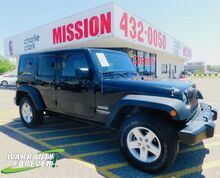 Part-Time Four-Wheel Drive, TRANSMISSION: 5-SPEED AUTOMATIC (W5A580) -inc: 3.73 Rear Axle Ratio, Hill Descent Control, Tip Start, TANK CLEARCOAT, RADIO: UCONNECT 430N CD/DVD/MP3/HDD/NAV -inc: SiriusXM Travel Link, 5-Year SiriusXM Travel Link Service, 6.5" Touch Screen Display, GPS Navigation, 40GB Hard Drive w/28GB Available, Remote USB Port, QUICK ORDER PACKAGE 24R -inc: Engine: 3.6L V6 24V VVT, Transmission: 5-Speed Automatic (W5A580). ENGINE: 3.6L V6 24V VVT (STD), BODY COLOR FENDER FLARES, BODY COLOR 3-PIECE HARD TOP -inc: If ordering without AEM (Dual Top Group), the black soft top will not be included, BLACK, LEATHER TRIMMED BUCKET SEATS -inc: Heated Front Seats, Front Seat Back Map Pockets, Driver Height Adjuster Seat, ALPINE 9-SPEAKER W/ALL WEATHER SUBWOOFER -inc: Amplified 552W 9 speaker, including subwoofer, 3.73 REAR AXLE RATIO, Wheels: 17" x 7.5" Polished Mineral Gray, Variable Intermittent Wipers, Trip Computer, Transmission: 6-Speed Manual (NSG370), Trailing Arm Rear Suspension w/Coil Springs, Towing Equipment -inc: Trailer Sway Control, Tires: LT255/75R17 BSW Off Road -inc: BF Goodrich Brand Tires, Tailgate/Rear Door Lock Included w/Power Door Locks, Sunrider Soft Top. Stop by Charlie Clark Nissan located at 3500 W Expressway 83, Harlingen, TX 78550 for a quick visit and a great vehicle!